It’s true, the holidays are not just around the corner – they are here! Use the Candy Box Punch from We R Memory Keepers to create an adorable advent calendar to display in your home. Fill the candy boxes with candy, notes, inspirational quotes, or presents, just to name a few. 1- Make the smallest box possible using your favorite Christmas paper. I’m using the really fun North Pole collection. 2- Tie one end of the box closed using ribbon or twine. 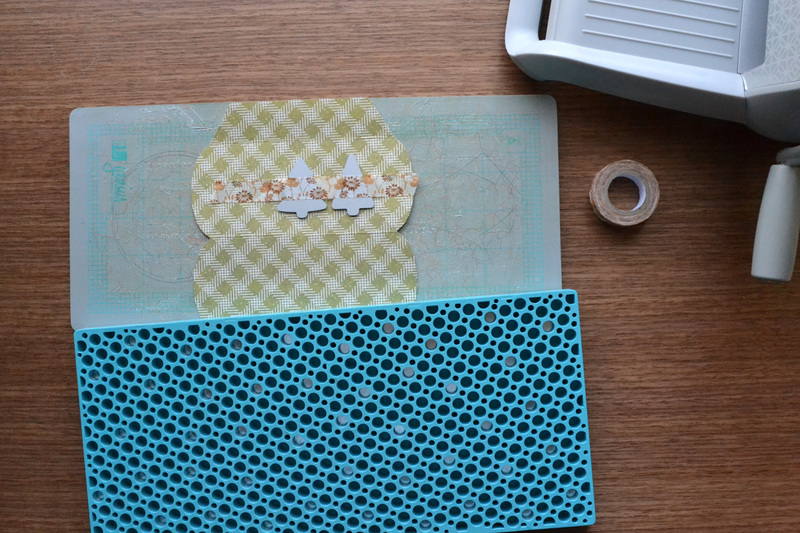 3- Cut small strips of patterned paper and card stock to decorate small clothespins. You will use these to hold the top of the box closed for easy access to treats. 4- Decorate the outside of the candy boxes as desired. You can number them with stickers or stamps. 5- Fill boxes with treats, or slips of paper with Christmas activity ideas. 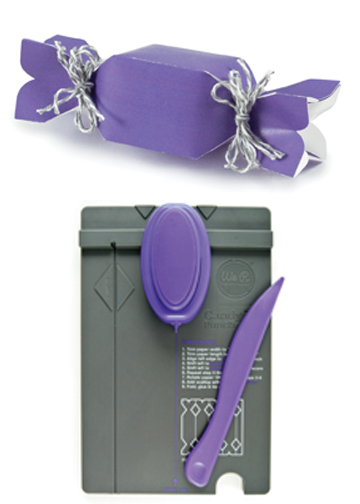 6- Attach boxes to ribbon or twine with the decorated clothes pins. Check out our how-to video to learn more about the Candy Box punch. A BIG thanks to We R’s designer Rebecca Fellows for providing the inspiration for today. With the holidays coming upon us quickly, we’ll be sharing lots of homemade gift ideas here on the We R blog over the next few weeks to give you some inspiration for your holiday crafting. I’ll kick us off today with a few ideas for treat packaging using the new Punch Boards. Recently I showed you how to make Window Boxes using the Gift Box Punch Board. Today I’ll show you how to use the Pillow Box and Gift Bag Punch Boards together with the Evolution machine, the Holly Punches Die, and the Evergreen Punches Die to create Cut-Out Treat Packaging. 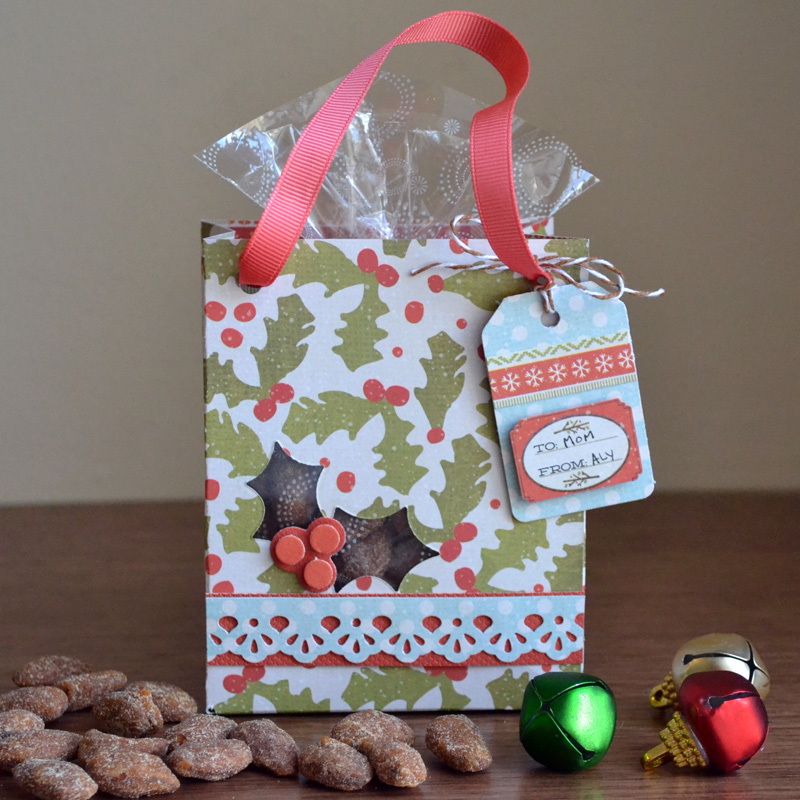 To create a Cut-Out Gift Bag, trim a piece of 12×12 North Pole patterned paper to 6×12 inches. Punch and score the paper according to the directions for a large gift bag. Then, place the punched scored paper on your Genius Platform cutting mat as shown below with the patterned paper updside down, then the holly die placed upside down on the front panel of the bag. Use a piece of washi tape to secure the die to the paper, then place the Genius Platform base upside down on the paper and die. Turn the “sandwich” right side up and run it through the Evolution. 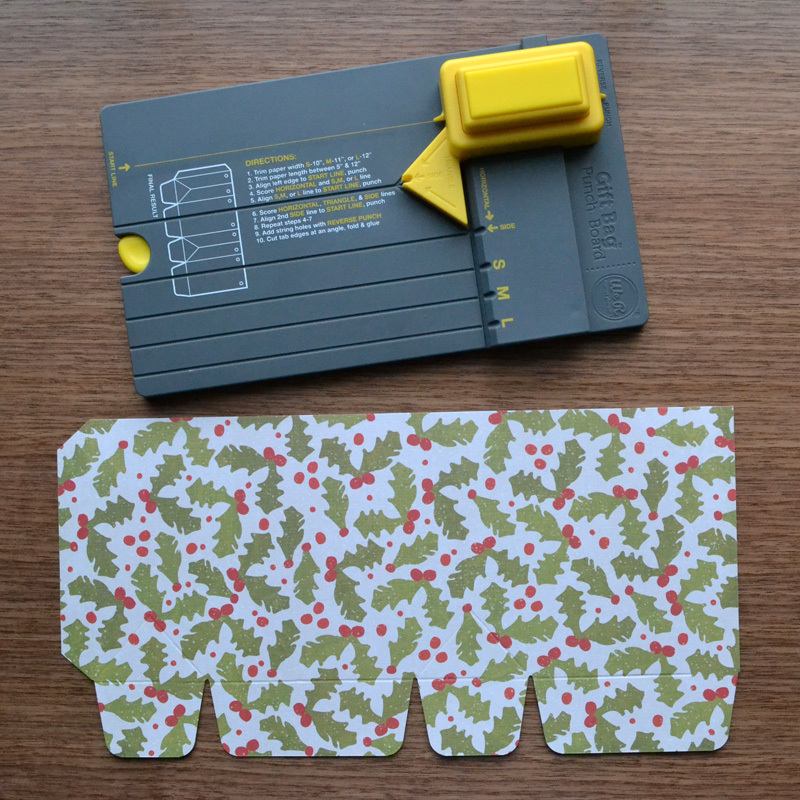 Carefully remove the washi tape and your bag will have a lovely cut out on the front. Trim a piece of plastic packaging slightly larger than your cut out and adhere it to the inside of the bag. Then fold and glue the bag together, adding a clear favor bag full of cinnamon roasted almonds, chestnuts, or mixed nuts. To create a Cut-Out Pillow Box, start with a 6×6 piece of patterned paper then punch and score according to the directions on the punch board. 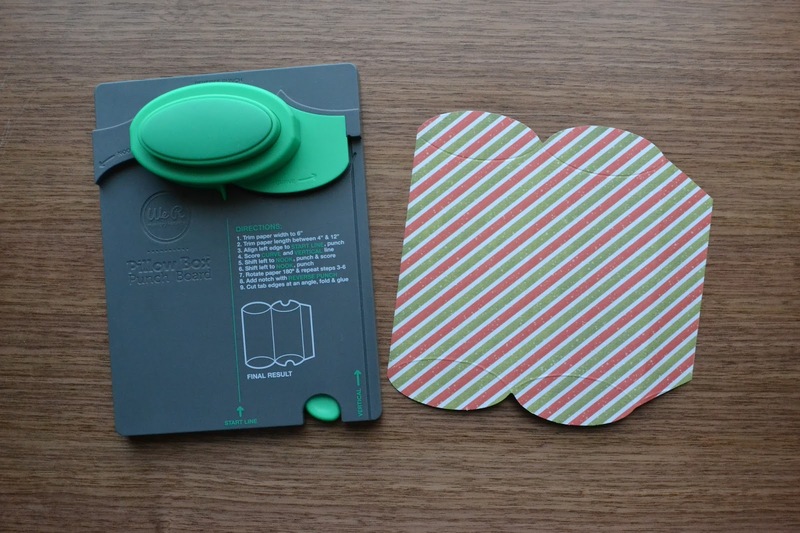 Then place the paper upside down on the cutting mat with the two Evergreen Punches Dies on the top of the paper on the front panel (next to the tab) as shown below. Place the Genius Platform base upside down on the paper and die, flip the “sandwich” right side up, and run it through the Evolution. Then remove it and place the tree die shown on the right in the photo above on the left side of the center tree and run the sandwich through the Evolution once more as described above. Add a piece of clear plastic cut from some packaging to the inside of the pillow box, then fold and glue it. 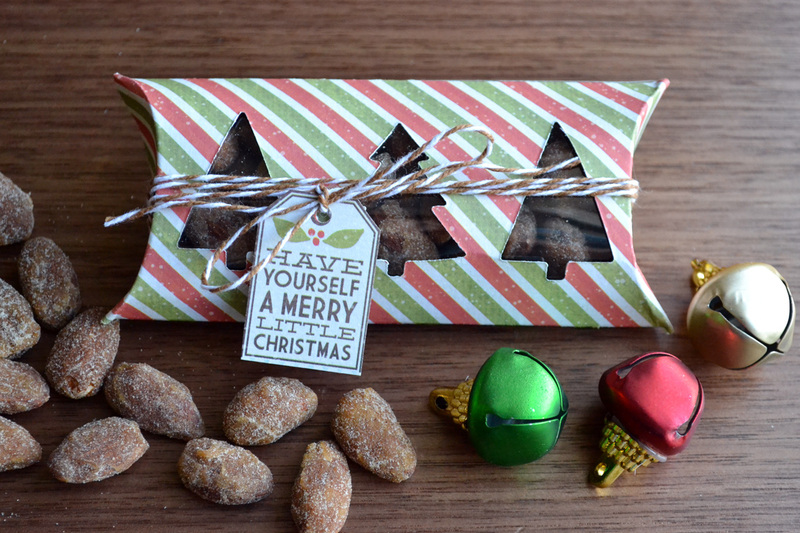 Fill your pillow box with roasted almonds, chestnuts, or mixed nuts and add some baker’s twine and a tag. This packaging trick is great for stocking stuffers, teacher gifts, or a little something for your neighbors and friends. You can create packaging for the upcoming holidays, or you can use papers and dies of any theme to create packaging for any occasion you need. Hello! My name is Lacey (Igo) Gasper, I recently got married this past summer and live in Moorhead, MN (across the river from Fargo, ND). I’m honored to be a guest designer for We R Memory Keepers and show off this awesome fall collection – Harvest! 1. Trim a piece of Kraft paper to 8.5” x 5.5” and fold in half. Adhere paper stripes at various sizes (my sizes listed above). And adhere onto the card at various levels. Splash on MIster Huey’s Ink (or ink of choice). I used an eye dropper to splatter my ink on. Adhere Embossed Sticker with Pop Dots to add dimension. Starting with your background (Work Bench), swipe with a foam brush some acrylic paint. I used a metallic Gold (seen on the left side of the layout). Cut a 5.5” x 9.5” piece and 6.5” x 5” out of Floral Spray. Adhere the 5.5” x 9.5” of the Floral Spray toward the left side of the layout. Out of the Garden Shed paper, cut a piece 1.5” x 6.5” and using a border punch, punch one long side. Adhere this piece to the backside of the 6.5” x 5” Floral Spray piece. Then, layer on a piece of washi (I used gold) near the seam of the chevron Floral Spray side. Next, using the WRMK Sew Easy, stitch the bottom right corner of this 6.5” x 5” piece. Adhere to the layout. Frame your photo. I used Kraft paper as my inside frame (size: 4.25” x 6.25”) and Garden Shed as the outer layer (size: 4.5” x 6.5”). Set aside. Adhere “You and Me” frame to the upper right corner of the page. 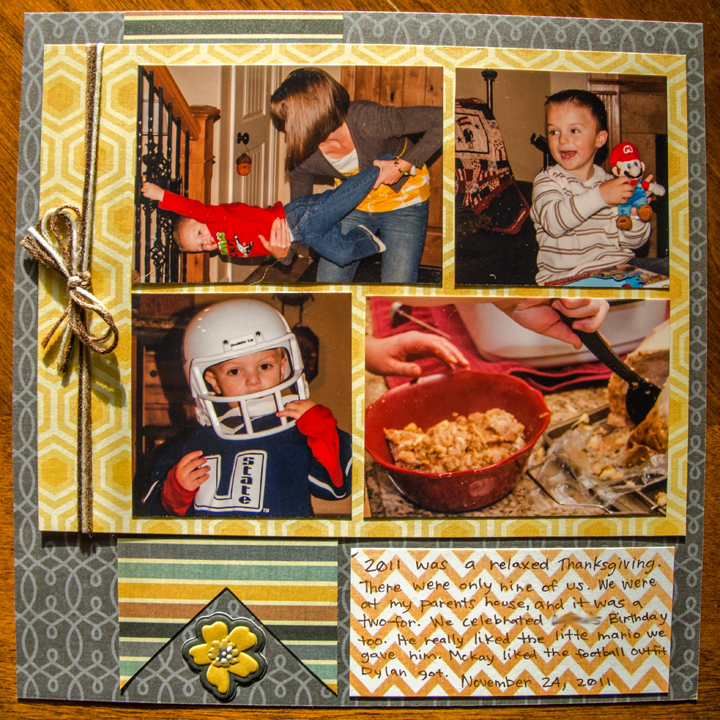 Adhere your photo Matt with 4×6 Photo to layout. apply WRMK: Harvest Embossing Stickers (some using pop adhesive for dimension). I adhered wood veneer hearts that I covered with Tim Holtz Distress Stains and Stickles. I stamped on Kraft Paper with Technique Tuesday stamps. Using various inks and Gold Embossing Powder. Finally, I adhered my title “You and Me” to the lower left corner of my photo. Cut frame from Silhouette cut file 3d Bracket Shaped Frame (I did not resize). Top of frame I cut from Rusty Drawer, backside of frame Kraft Paper. Assemble Frame per directions on Lori Whitlock’s youtube site (Adhere photo during this step). Next, I placed 4 – 6” x 6” pieces of paper on a Silhouette cutting mat (Kraft Paper, Country Plaid and two sections of the Maple Leaf.) 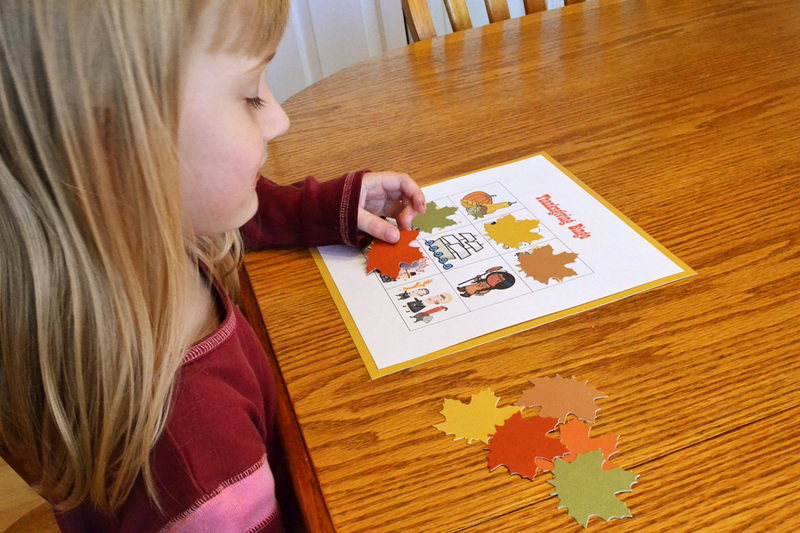 In the Silhouette Studio program arrange 3 Fall Leaves die cut file in various sizes. Cut these out. To add character to the kraft leaves, I used Tim Holtz Distress Inks. Using a non-stick craft mat, I rubbed and gently pressed Tim Holtz Distress Ink in the Mustard Seed, Spiced Marmalade, Fired Brick, Peeled Paint and Walnut Stain. I then sprayed with water and using the end of a paint brush I swirled the ink together slightly. I then swiped the Kraft leaves through the ink. To make them drive faster, I hit them with my heat gun. Crinkle or use an embossing folder to add texture. Ink the edges with Tim Holtz Walnut Stain. Layer leaves onto frame and mix in the WRMK Embossed Stickers. Adhere the “Pumpkin Spice & Everything Nice” phrase with dimensional adhesive. Creative table decor can add such a fun touch to special holiday meals. 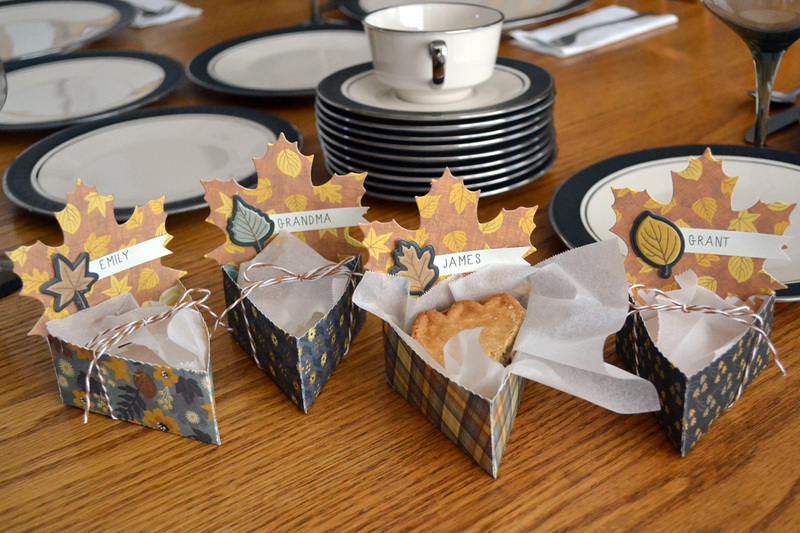 Here’s a fun idea for Thanksgiving place cards–pie boxes! 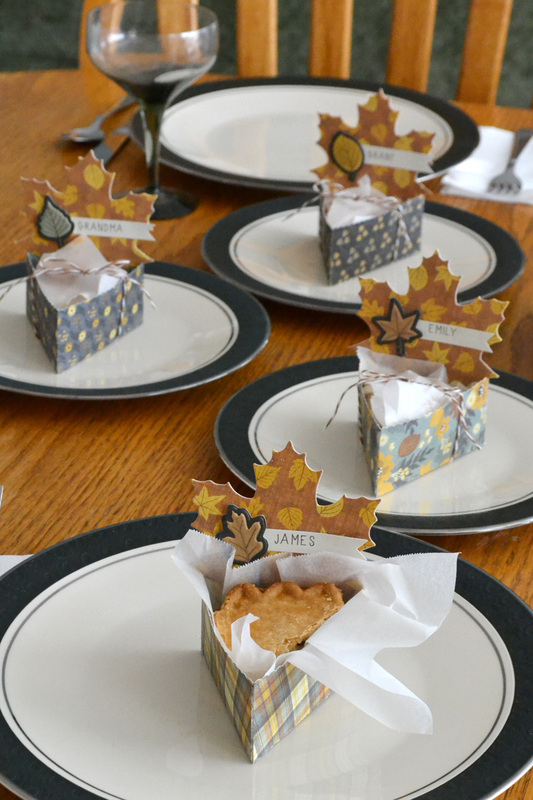 Cut pie boxes from Harvest patterned paper, decorate them with your guests names, and fill them with some warm, fresh pie. I used the Lifestyle Crafts Pie Box Die with my Evolution machine. Then I cut some leaves using the Lifestyle Crafts Maple Leaves Nesting Dies and adhered them to the back of the pie box. I printed my guests names on textured cardstock and added some Harvest embossed stickers to the leaves. Then I lined the boxes with parchment paper, added a small slice of my favorite apple pie, and finished it off by tying some brown baker’s twine around the box. Your guests will love these fun place cards–not only will they know where their place at your Thanksgiving table is, but they’ll have a yummy treat to take home with them when the feast is over. Have you started following us on Pinterest yet? If not, make sure to check out our Thankful Heart board for all kinds of last minute Thanksgiving inspiration. Make sure to check out the I’m Thankful Boats that you can put at your Thanksgiving table. If you’re spending the holiday with children–whether your own, your grandkids, nieces and nephews, or friends–here’s a fun game to play with them while waiting for the feast to begin. Download and print the free bingo boards HERE. 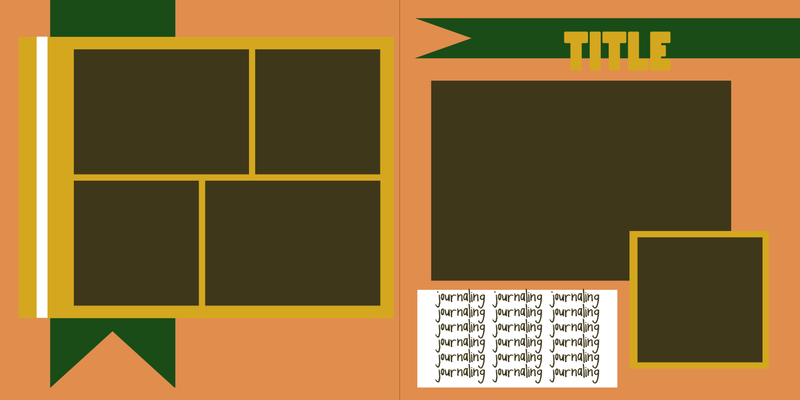 I recommend printing them on white or ivory cardstock and them mounting them on textured cardstock for added stability. You can print one extra board and cut out the images to use as calling cards. Then, using the smallest leaf from the Lifestyle Crafts Maple Leaves Nesting Dies, cut enough leaves from fall colored textured cardstock to cover each square on each board to use as markers. Play the game as is for younger children, or for older kids make winning more of a challenge by creating a specific pattern with the markers on your board (ie an”L” or “X”, by filling in two columns/rows, or by filling in your entire board. Enjoy, and happy Thanksgiving! Thanksgiving is one week away, which is exciting unless you are in charge of making the turkey dinner. We thought we would share a little Thanksgiving Inspiration before so you can have your camera ready to take some awesome shots to highlight your day. 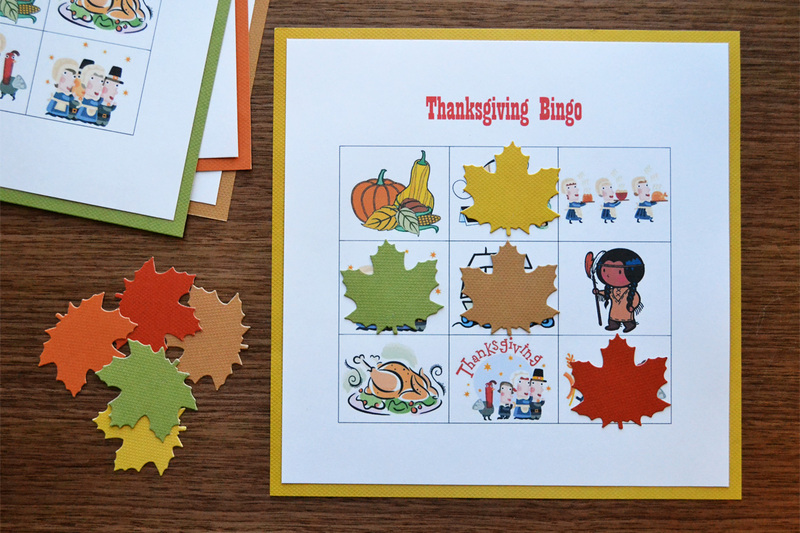 Guest Designer Kelsey Brown created a seasonal layout to share with us today. I am so excited to be guesting here at We R Memory keepers! 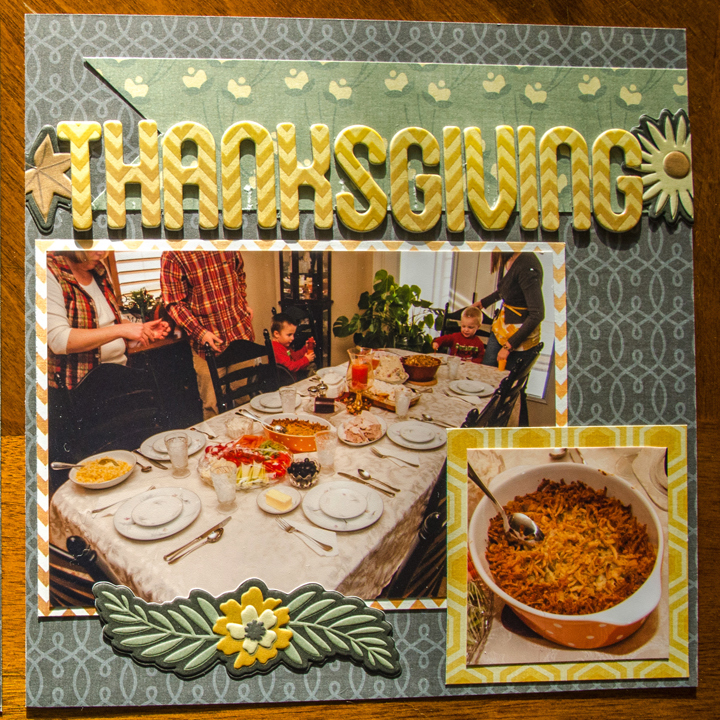 I love this new harvest collection and I could not wait to get started on my Thanksgiving page. I always have to have a plan so I used my Photoshop skills and designed the entire the layout on my laptop before I even made a cut. I was able use this design sketch to precisely cut everything out before I glued it down. It made it super easy to just glue it all down in a jiffy. As you can see there is a slight change from the original design, but it all worked out in the end. We have a winner! Woot! Help us congratulate Kimmy from Making Mondays. She said she will be filling her candy boxes with Candied Ginger! We hope she will share with us! Congratulations! Kimmy please email your address to ali@weronthenet.com and we will send you your punch board. We’ll be doing another giveaway soon. Check back in a few hours! Hooray for this giveaway Wednesday. We want to know what candy you would be stashing in these candy boxes! 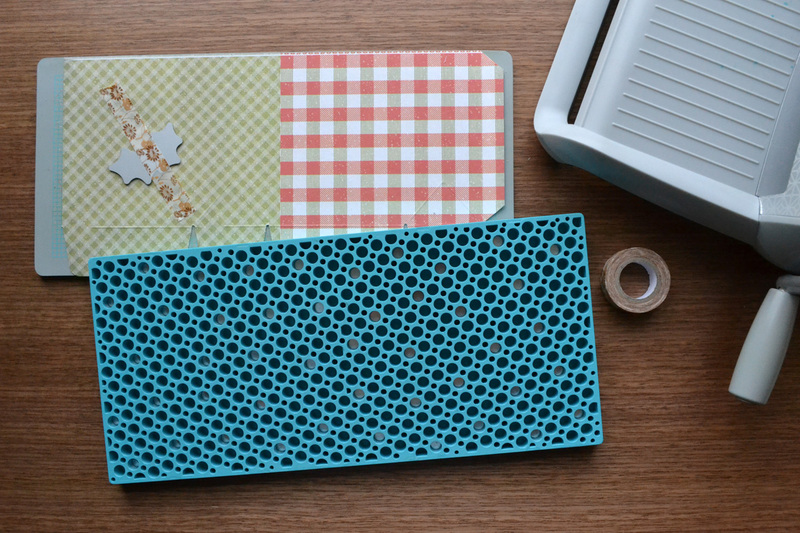 Tell us in the comments for a chance to win our Candy Box Punch Board! To enter, please post a comment on the blog.Comment as MANY times as you would like for the 30 minutes. Get ready for a comment-off! We love doing these giveaways we know you love them make sure you are sharing this with your friends. We have a very lucky winner!!!! Help us congratulate Sandy Jacklin. She’ll be really busy for the next little while creating envelopes like crazy. Help us send a big congrats. We’ll be doing another giveaway. Check back in a few hours! Happy Wednesday.